For those of you who don’t know, Reaper synth is one of the four synth that are introduced in Season of the Drifter. Every synth has unique abilities and serves special purpose. In the end, these synths are used to acquire parts of Gambit Prime armor set. 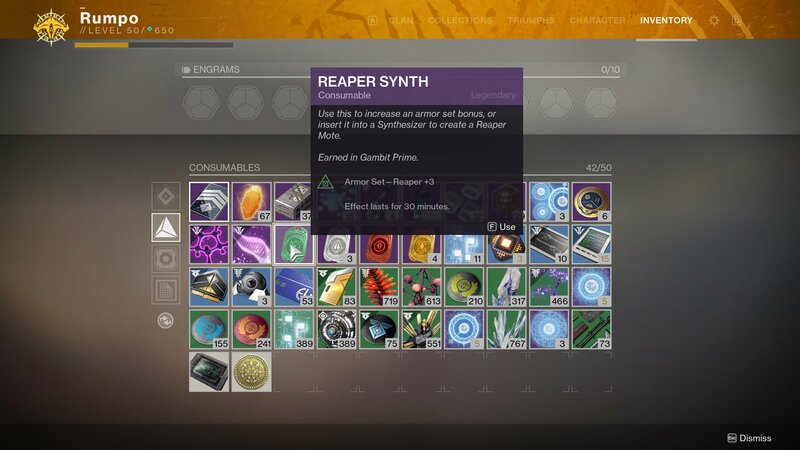 Try to participate in a maximum number of Gambit Prime and the Reckoning game modes if you want to find reaper synth. Synths are obtained through completing Gambit Prime challenges. You also get a chance of finding a synth by playing The Reckoning. As told earlier, Reaper synth is one type of synth only. Check out our article on how to get Sentry Synth in Destiny 2 in the game. Playing “The Reckoning” will get you a shot at finding Reaper synth. But it will also depend on your luck, as the synth drops randomly. A Reaper synth can be used to find Gambit Prime armor pieces. But before going to that step, you must find Weak Synthesizer. Reaper synth can be combined with Weak Synthesizer to construct a mote. Motes will depend upon the synth used to create them. Every mote will possess unique qualities and will have a chance at finding different armor piece of Gambit Prime. Don’t just settle for 1 piece of Reaper synth. The greater number of Reaper synth you have, the more chance you’ll have to earn precious piece of the desired armor. We hope our guide will lead you to harvest many Reaper synths. If you get stuck anywhere during the quest, feel free to heed our advice by asking it in the comments section below.